: A fan of Johny depp. Played pirate Lord. Who wouldne be? Catherine swan. 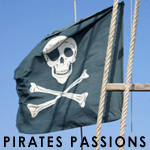 Pirates Lived a No Holes Barred Life! Not sure if I would have wanted to be the hole or the bar during those times. How about a reenactment?